My sweet friend just had a baby last night! Such a perfect excuse to throw a shower. Two of my friends and myself were the hostesses. I couldn't have asked for better help! I went back and forth with a theme and decided to not do an actual theme. 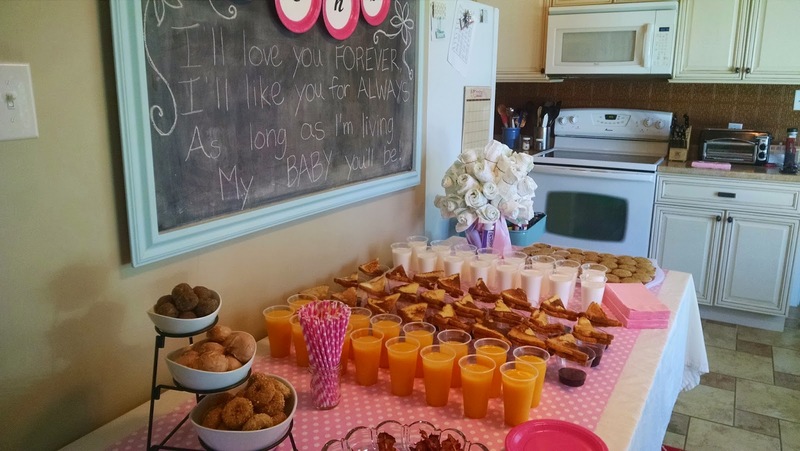 Just a baby girl shower. We offered brunch type food since it was from 10 am to noon. I also thought about doing baby blocks for the baby, but decided against it since my house is so little and we invited quite a few people so we would have had to have the blocks outside and it was WAY hot this day. I was going to have each guest decorate a block, but even without that activity everyone had so much fun talking and having a good time. It seemed like no one cared. I hope at least. I LOVE this quote from the book Love You Forever. 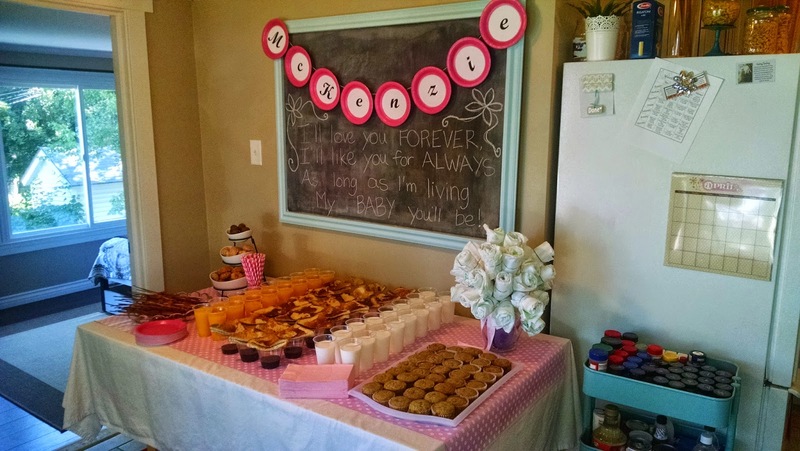 (That is one of mine and Hannelore's favorites, see post here) Since I love it so much I decided to use the chalkboard as the backdrop of the table and write the quote on there. 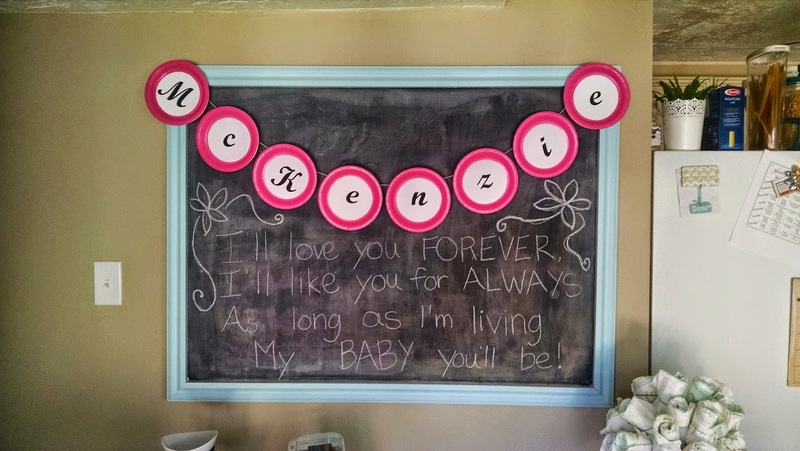 McKenzie's name banner was so easy and frugal, but it added a pop of color which I loved. I used paper plates and of course bakers twine (what don't I use that for). Then I printed the letters out on the comptuer. I used a bowl to trace the circle. I then cut out the circles and glued them on the plates. Last, I taped the plates to the bakers twine. It was really quick. My friends made all the wonderful food. They saved my life with helping with that. Mia made the banana muffins. They were so good! Oh and you want to know what the table "linens" were, The white is a flat bed sheet. They are so much cheaper than table clothes and so I usually use this as my bottom layer. The pink and white polka dots was wrapping paper. I did that for this party too. Do you see the diaper bouquet? My friend and I made it. We rolled up diapers (well Tera did that part) and she put a small rubber band around them. She then stuck skewers in the middle of them. I then took a vase and put travel sized baby lotion, Desitin, and baby shampoo/wash around the base of the vase. I put tissue paper down to hold them all in place and to make it look more pink. Then we put a floral foam on top of those. I wrapped the foam in tissue paper as well so you wouldn't see the green. We then started sticking the skewers in the foam. A word of advice on this. Leave your skewers long. That way you can position them where you need to and then cut the remaining off of the top (the extra part of the skewer will be sticking out the top of the diaper). 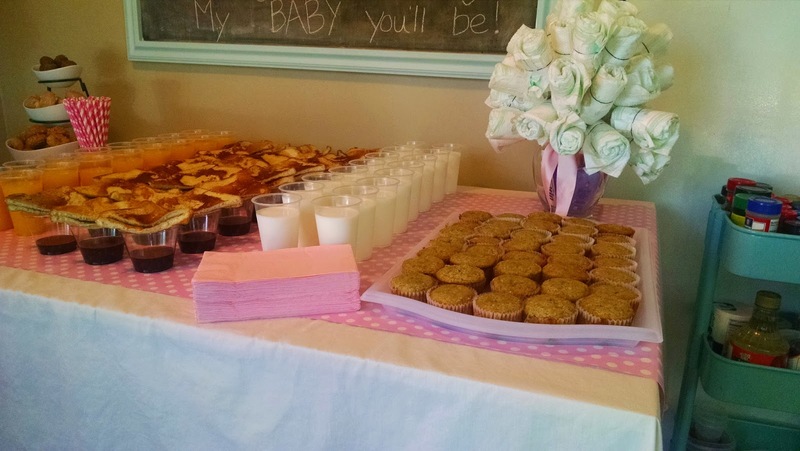 You will want some of them kind of side ways to fill out the bouquet and the diapers will be top heavy and want to fall. When this happened we taped the diapers to the skewer. I used it as part of the decor on the table as well as a gift. We bought a HUGE box of diapers from Costco so we gave her the extras and the extra hair ties from holding the diapers together so she can use them on baby McKenzie. Tera made the french toast and the HOMEMADE syrup. They were both so good. We put juice on one side of the table and milk on the other so people had options. I learned more people like juice. :) Mia was so wonderful. I asked if she could do bacon, but put them on skewers. I loved the way it turned out, but I know that was a lot of work. Thanks Mia! They were a hit and not ONE was left over. The kids loved them so much that they asked their moms to make them bacon on a stick. Everything is better on a stick, right?! Tera brought doughnut holes and of course they were delicious! I could eat those all day. Thank you so much for your help Tera and Mia! You ladies are wonderful! 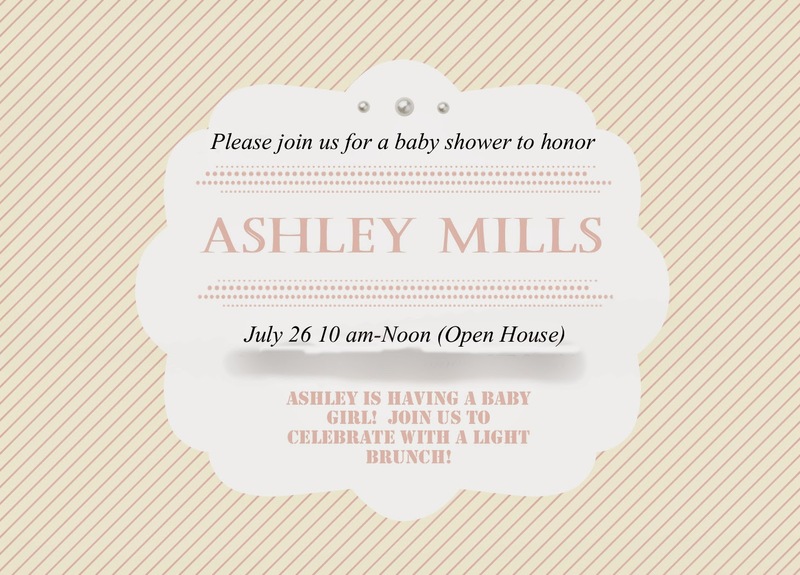 Congrats Ashley! 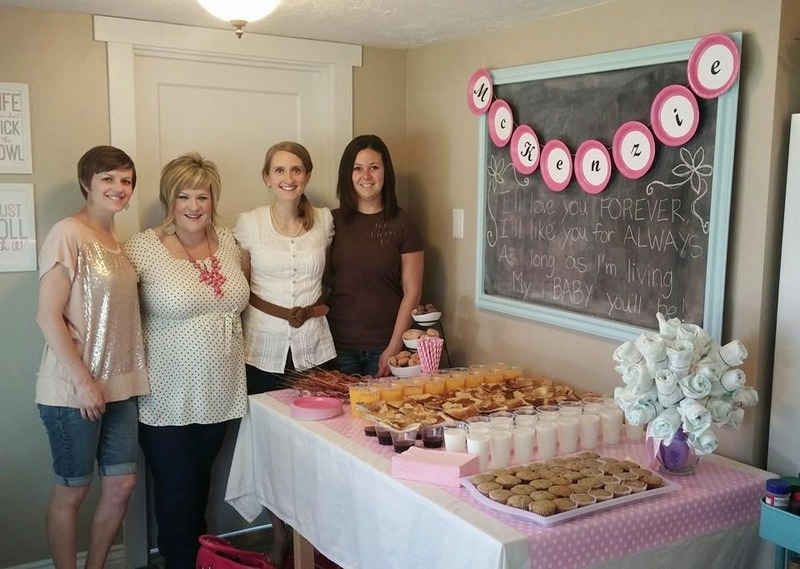 We are so excited for you and your sweet family! What a sweet friend you are! I love love love the I Love You Forever book but I have it hidden until my toddler will be old enough to read it for herself. I can't make it even halfway through without wanting to bawl my eyes out. I'm really dying for some breakfast food after this post now. Looks yummy! I know. I love breakfast food. Maybe that is why I really liked the shower. Looks like such a fun party and I really love the nam banner! Such a fun and cute touch! Thank you. I love how the name banner turned out! I will stop by today! Thanks for letting me know about the linkup! Congrats to your friend on the birth of her baby. 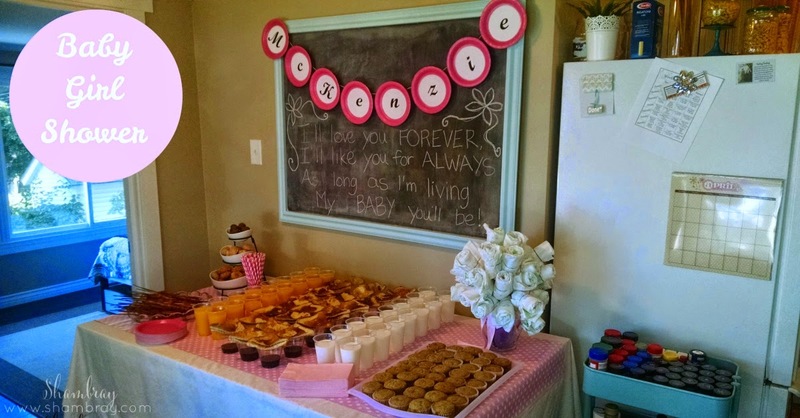 The decorations for the baby shower are darling, especially the banner. Thank you! I was so pleased with how the banner turned out! 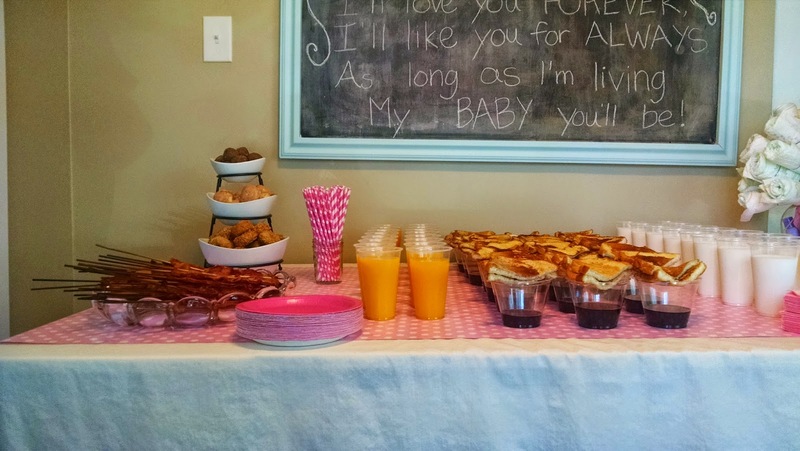 Oh my..I am not sure which is my favorite part of this shower...the banner..adorable...bed sheet...fugal and fun..diaper bouquet..genius...bacon on a stick...AMAZING! Thank you so much for sharing! Ok. You are too kind! Thank you for stopping by and letting me party with you!